Exceeded expectations. Flowers were perfect. Your floral arrangements were wonderful! We truly appreciate the personal service you gave us. The flowers complimented her viewing, dressed her grave & brought beauty to the reception and our home. Thanks Medford Florist & Gift Shop, you did a wonderful job on Tina's funeral arrangements. A bright spot on a sad day. Contact the incomparable Medford Florist for a stunning arrangement. Best Flower Shop in Medford. Stop in and place an order. You will not be disappointed!!! To future brides and even the casual flower buyer, you would be foolish to go anywhere else. ...(their) promptness and attention to detail were just what we needed. I have ordered flowers from you before…. and I would like to commend you on the beautiful work you do. I was so pleased with the corsage and table centerpiece. The flowers were so fresh and beautiful. Thank you for all you did to make my mother’s birthday so special. ...Medford Florist did a wonderful job on the flowers for our wedding. ...listened to what we wanted and completely met our needs. ...I continue to be impressed by Medford Florist & Gift Shop's quality, creativity and superb service. They did the flowers for my wedding last month and they were absolutely breath taking!!!! Very fresh and unique!!!! They looked so beautiful in the pictures!!!! The designers are very professional there and they could almost be NY florists!!!! Last minute dash to the shop for anniversary roses. Got exactly what I wanted and needed and then some. Very nice work. Sincere thanks for the beautiful flowers for the baby shower. I LOVE calla lilies and they were the talk of the shower being in such an amazingly beautiful arrangement. The flowers for our family celebration were simply magnificent. Thank you beyond measure. Thank you for the beautiful flowers and work you did for my father’s funeral service. The flowers were truly lovely. I ordered a dozen roses from them for my GF at valentine's day. They were awesome and she loved them. They were so much nicer than some of the other flowers I had gotten from other places and especially from some places I have ordered from online. I'll definitely be back! 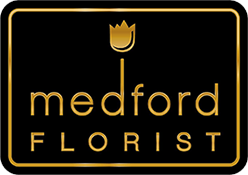 Medford Florist is my new florist of choice! Thank you for the lovely flowers. They lasted so long over the holidays and were just, well, lovely. ...you did a wonderful job on.....funeral arrangements. A bright spot on a sad day. My husband sent me a bouquet from Medford Florist & Gift Shop for Valentine’s Day and oh my this is the most beautfil arrangement EVER! It is so much more appealing than your run-of-the-mill bouquets. It is breathtaking. Thank you for the lovely arrangements for my Grandmother’s 100th birthday and the staff helping her: they were admired and spectacular! I appreciate your efforts. They stand behind their slogan of "Delivering more": more flowers, more value, more quality! Got my mother a beautiful arrangement from Medford Florist & Gift Shop. They obviously know what they’re doing here. Highly recommended. The casket spray you made for my mother’s funeral service was truly beautiful and made the viewing and services so much easier to deal with. I was recently home on my 2 week R&R and my wife raved about the quality and beauty of your floral arrangements. Thank you for all your support during my mobilization. I would just like to mention how appreciative I am of the services your shop provides. The arrangements are always beautiful, creative and a work of art.